Clipped hand cleaning cards and handles are used for fettling of woolen fillets and stripping of metallic wires. Now there is no need for nailing the hand cleaning cards to wooden pieces, which leads to improper mounting and uneven cleaning. Cleaning Cards , Products Etc. 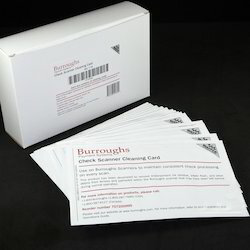 Our new cleaning cards use the power of WaffleTechnology® to get your Digital Check scanner cleaner than ever! The improved design keeps the card in uninterrupted contact with the cleaning surface as it passes through the scanner track, removing more dirt and dust in fewer passes. The accumulation of dirt is a significant problem for these types of equipment; our dry cleaning card keeps down the cost of maintenance and gives superb cleaning performance at both the card insertion slot magnetic head and the belt carrier. WHY CLEAN In the course of regular operations electronic equipments are subject to a variety of pollutants. - Residual Dirt left by Cards, Notes, etc.